Just got back from my first fill and I must say... It was not that uncomfortable at all. 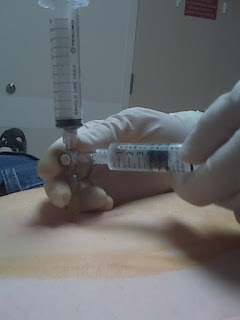 I was washed with betadine, then numbed up (tiny sting, nothing bad) then the fill needle...which I didn't feel at all other than some pressure. I received 4cc's in my 10cc realize band and I am scheduled for another (smaller) fill in 10 days. That is a big fill and wow for another one in 10 days!! Really though, this might be all you'll need so take it easy and listen to your body! :) Good luck darlin'! Congrats and I'm looking forward to hearing how it all goes for you. I only have a small fill and I know I need more and will do so next week. Good luck to you! !